Integrating into the urban landscape, the humanitarian sector has contributed to various processes of transformation in Goma. While creating new opportunities, their presence has reinforced patterns of conflict and competition over the urban political and socioeconomic space. The border city of Goma, provincial capital of North Kivu in Eastern D.R. Congo, is a clear example of a regional ‘NGO­pole’: the city is housing the logistic headquarters of close to 100 international humanitarian and development organisations that operate in war­ affected zones around the city. More than 15 years of state decline, violent conflict and massive human displacement have transformed Goma from a dormant town into a notable ‘siège de rébellion’ not only attracting rebel leaders, business executives, peacekeepers, refugees and internally displaced persons (IDPs), but also a growing number of humanitarians. Their ever-­increasing presence has become a significant factor in the recent shaping and reshaping of the city’s profile and its shift towards an attractive ‘zone of opportunity’. But apart from creating opportunities, the concentration of international humanitarian organisations and their expatriate staff has also resulted in additional conflicts and contrasts. In a particular context of a weak institutional framework, informal urbanization and a highly contested economic, social and political urban arena, the international humanitarian presence has become a significant factor in reinforcing patterns of conflict and competition across the urban political and socioeconomic space. The settling of vast numbers of international humanitarian agencies in urban centres, particularly during protracted humanitarian crises, has a considerable bearing on local socioeconomic realities and even contributes to processes of political and spatial urban transformation. The emergence of urban ‘NGO­poles’ in regions confronted by war, disasters or humanitarian crisis, has been mostly disregarded in academic humanitarian studies. Issues such as the spatial integration of the humanitarian sector or the impact of their presence on the local political economy, on local power and authority structures, on socioeconomic strategies of local inhabitants and on issues of redistribution and access to vital resources, largely remain unaddressed. Furthermore, the humanitarian sector itself seldom pays attention to these issues and is chiefly concerned with the effects of its programmes on the targeted area or community, thus seriously underestimating their indirect impact. View of Goma from aeroplane. The Congolese war is generally described as the most severe humanitarian crisis since the end of the Cold War, causing immense suffering, the destruction of economic and social infrastructures, and massive displacement. This crisis also attracted an increasing number of international humanitarian organisations, of which many settled in Goma. But the expansion of the humanitarian sector in this city occurred in several ‘waves’, in conjunction with significant episodes of armed conflict in eastern DRC. After the inter-ethnic violence of 1993, the next phase of entrance of humanitarian agencies occurred with the influx of hundreds of thousands of Rwandan refugees in camps in and around Goma, in the aftermath of the genocide in April-June 1994. Within two months, almost 150 humanitarian organisations arrived in Goma. This arrival has by some been described in terms of an ‘NGO scramble’ referring to the hyper-competitive relief market (ibid). But the humanitarian relief effort was increasingly criticized as aid flows were being militarized by former Hutu militias and served the interests of local politico-economic elites who manipulated humanitarian aid for their own benefit. After the controversial relief experience of 1994, humanitarian actors started outsourcing activities to local NGOs. 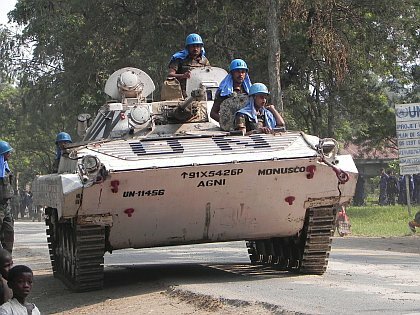 Following the start of the Congolese war in 1996, UN agencies entered the local humanitarian scene. And between 1998 and 2002, when Goma functioned as the siege of the RCD rebel movement, international aid agencies and NGO’s came to play a considerable role in the provision of urban social services such as health and education, which were increasingly outsourced by the rebel movement. The eruption of the Nyiragongo volcano in January 2002, was the next trigger to an increased humanitarian presence in Goma. The eruption destroyed large parts of the city and the absence of any centralised planning or official intervention left the urban population in harrowing conditions; and so the international humanitarian sector took the lead on relief, aid and reconstruction and numerous new agencies joined those already present. The last and most important expansion of the ‘humanitarian sector’ in Goma was a direct result of the intensification, in August 2007, of the war in North Kivu and the displacement of hundreds of thousands of people. During this episode of the conflict, the number of international NGOs in Goma doubled and newcomers’ programmes also increasingly focused on longer ­term development. This expansion happened in parallel with a growing presence of the UN peace keepers and humanitarian staff in Goma, turning the city into one of the main UN hubs in the country. Humanitarian agencies had a strong influence on the local urban economy but also became an inherent part of it. The most direct and obvious impact of their presence was on the local job market. The expansion of the humanitarian sector was associated with a growing demand for trained personnel, guards, cooks and drivers. Given the lack of state functioning and of employment opportunities, humanitarian agencies acquired a considerable share of the local labour market. Connection to the international NGO network became an important asset in local urban survival strategies, which explains why practices of preferential treatment or ‘ethnic patronage’ developed in line with the expansion of the humanitarian sector. This expansion also provoked a swell of local NGOs and a general trend of ‘NGOization’ of local society. These organisations became vital components of the survival strategies of urban inhabitants and have replaced the state in many areas of public life. In search of opportunities, Goméens increasingly see the creation of NGOs as a livelihood asset and as a means of gaining access to international funding. The increasing humanitarian presence also promoted the development of alternative urban economic activities. As a huge group of ‘consommateurs du premier ordre’the sectors’ specific demands for consumption, equipment, housing and recreation, as well as its strong purchasing power, created a strong stimulus in the local urban economy. But it also led to a ‘dollarization’ of local economic transactions, a trend that even would affect the rural economy. Also the growing policy to ‘buy locally’ disrupted the local economy but created additional opportunities. For the provisioning of humanitarian agencies, agreements were made with local traders, often based on personal or family connections. For local commerçants, it was key to have connections to these ‘humanitarian networks of patronage’, and to adapt their merchandise to the demand of the international staff. Local markets also transformed as a consequence of the humanitarian presence, as is illustrated by the emergence of large­scale and expensive supermarkets. Another sector that flourished with the expansion of the humanitarian sector is real estate. The concentration of international staff in a restricted number of areas of the city resulted in growing demand for specific housing infrastructure. Real estate became a booming business, tempting many established business executives to invest in this sector. This occurred in conjunction with the expansion of a ‘touristic infrastructure’. What Goméens used to call ‘le tourisme humanitaire’, is probably the most visible impact of the international staff presence in Goma. Luxurious hotels, bars, restaurants and nightclubs have mushroomed, with many almost exclusively oriented towards an international clientele. So the development of a ‘humanitarian industry’ has brought significant changes to Goma’s economic space. But the opportunities related to these changes in most cases are preserved to a small group of well­educated Congolese development workers and a small elite of established business executives. 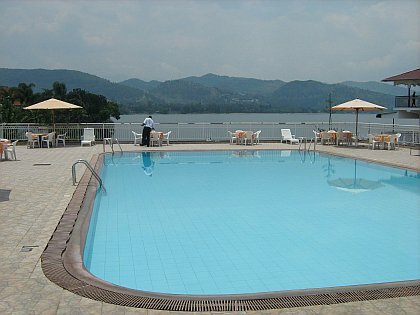 While during the war, close ties with the rebel leadership made it possible for this elite to control large parts of Goma’s economy (aviation, natural resources, oil products and real estate), also the presence of the humanitarian sector created attractive economic opportunities. Profits made in one sector (hotels, petrol and real estate), were simple reinvested in others. Goma’s growing significance as a ‘humanitarian space’ also brought about important socio­geographic changes and left a visible imprint on the urban landscape. The city’s development and expansion has to be situated in a context of informality and quasi absence of state authorities in urban planning. The presence and interference of humanitarian agencies only further strengthened the shift towards privatised urban planning and development. While a massive influx of IDPs resulted in the emergence of new informal districts in the urban periphery that were deprived from any urban infrastructure, water provision, electricity network, schools, health centres or markets, at the same time a gentrification of the central districts could be observed as a consequence of the settlement of international humanitarian organisations. With its numerous NGO establishments, UN compounds, luxurious residential areas, hotels, bars and rebel headquarters, these central districts gained increasing importance and came to represent modernity, global culture and new lifestyles. Specific demands for housing and working infrastructure as well as economic demands increased the socioeconomic significance of these central districts, and improvements in the overall urban infrastructure (such as electricity, internet, roads and water) turned them into the real ‘quartiers riches’. These developments not only reinforced the discrepancy between centre and periphery, but also confirmed the spatial divide between urban rich and poor. The inflation of rents, increasing prices of houses and land, and the profound dollarization of local markets in these central districts further sharpened the socio­geographic urban fault lines. For many ordinary Goméens, it has become almost impossible to live in the eastern central parts of the city as these gentrification dynamics reduced their access to urban infrastructure and public services. In sharp contrast to the main objectives of their interventions, humanitarian actors’ presence in Goma contributes considerably to the increasing marginalisation and exclusion of the urban periphery, and to the confirmation of a ‘ville duale’ , where, as many perceive, old colonial structures of inequality and social and spatial segregation are being reconfirmed. An additional side-effect of the humanitarian sector’s presence and interventions is the encouragement of state withdrawal from public services and a transfer of power and legitimacy to the advantage of international actors. This sector has largely taken over education and health care, and even the rehabilitation of road infrastructure. Due to a lack of means, capacity, motivation, vision, corruption and mismanagement, state services have been constantly hollowed out and have increasingly been replaced by new coalitions of local and international development actors. One of the consequences is that urban decision making gradually became the responsibility of non­state actors, even if they could not claim any local legitimacy. Today, international aid agencies have not only replaced the state in several key sectors, but also development is understood locally as a responsibility of the humanitarian sector. The coincidence of a rebel-controlled local war economy and an expanded aid economy led to a further reduction of state sovereignty, which in the context of post­conflict reconstruction and the reinforcement of state capacities, may have a disastrous long­term impact. Humanitarian organisations’ dominant role in local urban governance processes has significantly reduced the bargaining position of the new state administrations, which today have no capacity at all to attach conditions to international agencies’ interventions and are continuously forced into a position of negotiation. Sesnan, B. (2004) ‘The case for cash: Goma after the Nyiragongo eruption’. Humanitarian Exchange. 28. pp. 40–42. Vlassenroot, K. and K. Büscher (2009) The City as Frontier. 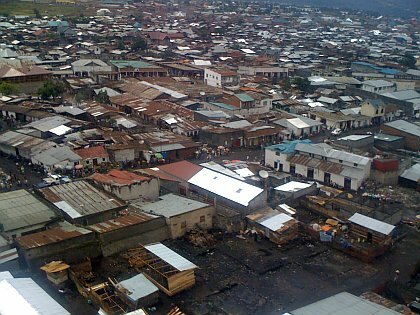 Urban Development and Identity Processes in Goma, D.R. Congo. Working Paper 61(2). Crisis States Research Centre, London School of Economics and Political Science, London. Coghlan, B. et al. (2009) Mortality in the Democratic Republic of Congo. An Ongoing Crisis. International Rescue Committee, New York, NY and Burnet Institute, Melbourne. Cooley, A. and J. Ron (2002) ‘The NGO scramble: organizational insecurity and the political econ­ omy of transnational action’. International Security. 27(1). pp. 5–39. Giovannoni, M., T. Trefon, J. Kasongo Banga and C. Mwema (2004) ‘Acting on behalf (and in spite) of the state: NGOs and civil society associations in Kinshasa’. In: T. Trefon (ed.) Reinventing Order in the Congo. How People Respond to State Failure in Kinshasa. Zed Books, London and New York, NY. pp. 99–115. Grünewald, F., E. Levron, E. Aberlen and H. Bonvalot (2004) Villes en guerre et guerres en ville. Pratiques humanitaires en question. Karthala, Paris.